I’m Getting Fit With Jen – Want To Join Me?! Everyone who knew me before January of 2012 knows that I did not like to exercise. No way, no how. Exercise was painful and I was very sure that I didn’t have time for it. That is why, in January of this year, when my friend Jen asked me to join her in her workout routines, I choked, laughed, and ran far, far away. Well, I didn’t literally run far, far away, because that would have involved exercise, which was not something I ever did. But you know what I mean. Jen urged me on; she told me how much fun it would be for us to work out together; she told me how much better I would feel. Stinkin’ asthma. Which led me to another excuse I’ve always given to avoid exercise – it would trigger my asthma. So no thanks on the workouts. I would simply continue eating a wonderful diet of nutrition packed foods. That is all I needed to be healthy. Well, Jen is almost as stubborn as I am, and so she nicely pushed and told me to think about it some more. She promised to go easy on me, but felt sure that I wouldn’t regret the decision to become more active. Matt agreed with Jen, knowing that I would benefit greatly and become stronger from the workouts. He’s been forever concerned about my lungs and asthma. He was also not nearly as convinced as I had been that simply eating a healthy diet (and skipping the exercise) would keep me healthy. I finally agreed reluctantly to give this workout thing a try – mainly because I knew that my lungs and overall body needed to get into shape. I figured I would last a total of two and a half days, and then I could move on back into my happy place – my comfortable kitchen where I would always and forevermore be content baking muffins and reading school books to my children. Twelve weeks and approximately 55 workouts later, all I have to say is this: Jen is a miracle worker. The girl has made me fall in love with exercise. She’s whipped me into shape, and she’s somehow figured out how to make it fun. It didn’t take long at all for me to notice a difference in how I was feeling. In fact, I feel better than I have felt in years. I have loads of energy. I’m standing straighter. I’ve had to tighten my belt two notches. We’ve been walking, lifting weights, and doing workout videos. 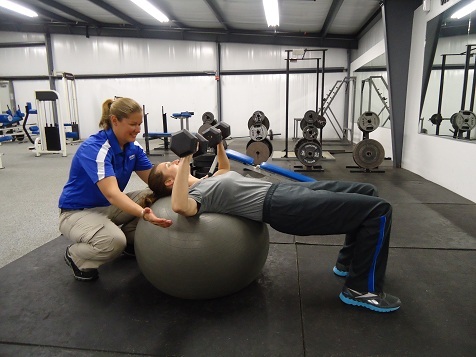 Jen is so gifted at this personal trainer business that she is now working toward becoming a Certified Personal Trainer. I am so excited for her! If you are like I was, you may have no idea where to start on your fitness journey. You may wonder how you can even schedule exercise into your already very busy life. You may wonder how to involve your children. You may have all kinds of questions about working out and exercise – I know I sure did. I can’t believe how much Jen has taught me in such a short time. So here’s how we’re getting started with this today. First, make a decision – are you ready to get fit? I realize that this may not be an easy decision for some. But oh how I hope you’ll join me on this journey! You won’t regret it. 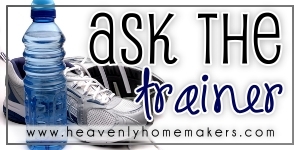 Next, what questions do you have that you’d like Jen to address in this new “Ask the Trainer” feature? Let the comments begin. Who’s ready to get fit!? Laura – I’m so happy for you that you have fallen in love with exercise! Jen has done a great job, I guess! I too love to exercise and usually aim for about an hour 5 days/week. I usually do my workouts in the morning before others get up in the house, but it doesn’t always happen. I was just wondering when you manage to squeeze in your workouts? I also homeschool and cook/bake about as much as you I think. It all takes time. Just wondered how YOU managed to make time for it? Your life is a lot like mine! Everytime I do get into a good exercise routine it feels so good. It’s nice to do something just to take care of me (which we have to remember to do so we can take care of everybody else!). Last spring & summer I got up early, really early, and walked with my neighbor. That was the best! No one up to take care of yet and I knew she was across the street waiting for me so I had to get up. If I have to stay home (my husband works a lot of hours during track season and travels) then yoga videos are my favorite. I’m still consistently inconsistent, but I just keep trying to get better. The question I’d like to ask Jen is: If you know your personality type would really benefit from the persistence of a trainer but can’t afford either a gym membership or the trainer, what would be the next best thing? Any tips for getting a discount? Would a trainer trade service for goods or service? I’d also be interested in Jen’s overall opinion of the biggest loser books, dvds etc. stuff for use at home? I definitely need to fall in love with exercise! I am 36 and have not done any exercise since my mid-teens, seriously. I eat okay, but not super healthy. My weight is healthy, although up and down with pregnancies, but my main problem is motivation and just plain fitting it in! I am not even sure there is a solution for me to ever exercise in this season of life. I am currently 34 weeks pregnant, with some ligament issues in my back and hips which makes prenatal exercise impossible. Hopefully it will clear up postnatally after a while. Also, I forgot to add, we have no money whatsoever! I definitely couldn’t afford to pay to do any sort of regular exercise – even buying a DVD is pushing our budget right now. I never get chance to get out without the children – absolutely never, unless my husband is watching them for me on rare occasions. We have no space in the house to exercise (we are in a tiny 600sqft home at the moment). I think I would be a major challenge to a fitness trainer, lol! You’re story sounds very familar to me! I just had our 6th child, ages are 6.5, 5.5, 4, 2.5, 1.5 and now 4 weeks (and not sure we’re done either)! We live in 800 sq foot apt. Time is never there, especially since I’ve been making our own everytning possible. We do have the money but time and space is not there. The only other thing I have thought about doing is getting something the older two girls could do with me as the 4 babies all take an afternoon nap, but right now that is our distraction free school time. Not sure I could fit in even a half hour of exercise. The diet has made such a huge difference and I know exercise would be even better.. here’s to hoping! 1. Walk. By yourself, or with all the kids. Put younger ones in stroller(s) and let older ones push. Walk the neighborhood or go to a park. 2. Play. With the kids. Soccer, basketball, kickball, catch, Frisbee, anything that sounds like PE. 3. Videos. From the library, YouTube, or Netflix. 5. Yard work. If you don’t have a big yard (which I assume is the case), is there a friend or relative you could help? Maybe start a small garden? Or a community garden? Involve the boys! This could potentially ease the food budget too! Finally, your boys are young. If they don’t cover absolutely everything in the early years of schooling, they will pick it up later. Focus on the basics of the three R’s. Then focus on your health. As your boys get older, you will need even more energy and you’ll be thankful you took care of your health! I have back problems and every time I start a fitness routine – even one targeted at “strengthening” my back, I end up having back pain which defeats the purpose of the exercise in the first place. How can I overcome this? I also get really bored during exercise and end up going less and less or doing less and less reps to try to get out of it…. I am consistently inconsistent with exercise as well. I started running on my treadmill back before Christmas and I loved the feeling! For me, I think I need to find the right time to exercise. I hate doing it early in the morning, yet if I don’t, it doesn’t happen. Basically, it boils down to me just picking a time and sticking to it! I tried going to jens site and was unable to see it. If I could ask jen a question, I would ask her what she knows about abdominal separation (from having babies) and if she’s seen it repaired through exercise. Good for you! but when do you fit it in? I homeschool by 2 boys and try to make everything from scratch (love your recipes!) plus help my husband with his business. I really need to exercise so I am game but I need to figure out how to make it happen! I am a mother/homeschooler of 4 and expecting # 5 in August. Time is not something I have a lot of but I try to get in 15-20 min a day on my elliptical in the late late evening. Any suggestions on how hard (i.e. resistance/incline), length of time, & how often each week I should be doing this type of exercise? Looking to keep my labor as easy as possible. Suggestions welcome. Jen, do you have any suggested exercises for greater range of motion in the hips. My husband has arthristis and finds if he stretches it’s better. He only knows one stretch and would like to do more. I love the timing of this. Our small town is starting a “biggest loser” 10 week challenge starting this Sunday. My hubby and I signed up yesterday. We always talk about excercise, but rarely do it. I’m excited for this topic!!!! I am so looking forward to this new feature, and i will check out Jen`s website ASAP! That is great that you have found you like it and it is helping. I know I need to exercise more and I want to – I really do. But something always gets in the way. I usually get a walk in, but that isn’t enough. I want to be a runner. I want to like running. I have started and stopped more times than I can count and I am not ready to give up yet. I just need to motivation to get back out there and try again. And actually do it for more than 2 months and then quit again. I’d love some suggestions for what to do during the summer when it’s HOT (highs in the upper 90s and 100s). Too hot to go out and walk, even at 8 in the morning. I don’t want to join a gym, and library workout DVDs never really seem to motivate me for more than a week. But maybe if I had a good alternative? Ok… I had a baby 4.5 weeks ago and I have been cleared to work out. My husband wants me to do cross fit with him (he is a firefighter and he has been doing it at the station for years.) It’s pretty intense. Is this safe for me? I did one work out yesterday and other than being sore I feel ok. Please don’t say “ask your dr” I had my baby with a midwife and I never go to the dr. I had asthma as a kid and the thought of running and wheezing makes me, well….wheeze. However, as I was playing around with my six year old daughter today she smacked me on the rear end and laughed, “Mommy your bottom jiggles!”. To make matters worse my husband laughed so hard he almost choked. SO, I guess I am ready to start exercising! Here is my question. I have exercised ranging from 30 minutes to two hours a day and seen zero results. I have done this for over a year one time. And no results in clothes size or weight. I know food plays a factor too but even with eating less food I saw no difference. Honestly when it doesn’t help me get into a smaller size then it’s not worth taking away that much time from my kids each day. Would love to know something to make it actually worth it. I started power walking 5 miles a day about a month and a half ago. I am up to running about 3/4 of each lap and power walk about 1/4 of each lap. My goal is to eventually run the whole 5 miles each day. Each week I run a little bit more of each lap. I have been wondering if this is a good way to go about getting up to the whole 5 miles or if I should be running solid and gradully increase the number of laps? Also, what kind of running shoes do you recommend? I’m sooo excited about this opportunity to pick your brain! Thanks a lot! Video suggestions? I’m fairly motivated, used to be an avid cyclist before kids. Got little ones, live in a COLD climate. I try doing squats and other basic excercises, but need some variety. Thanks!!! Like many of the above, I’d love thoughts on actually making it work. I have 5 little ones, my DH works upward of 12 hrs min a day and when he gets home, evenings are hard to get out, or he’s too tired to watch the kids. Still getting up multiple times a night nursing makes getting up earlier in the morning pretty impossible as well. Just getting everything done in a day is exhausting. Homeschooling, feeding everyone multiple times, laundry, cleaning….. we can occasionally make it out for a short walk to the park or the like, but much beyond that is seeming impossible! I have a question! I am otherwise slim, but after my big baby boy was born 6 yrs ago, the muscles in my belly never went back. My belly sticks out like I’m 4 months pregnant. It’s hard. Plus my uterus is starting to prolapse. All of this is hard on my digestive system. My dr says do Kegals, but they sort of make me feel sick when I do them. Plus, I really don’t think they will take care of the whole problem. My belly DRIVES ME CRAZY and ! Any suggestions:)? I have pretty much always exercised at least some. I’m in my late 40s and until about 18 months ago, I ran three times a week and walked when I could (probably one to two times/week). But after a meniscal tear and somewhat costly surgery (after about 16 years of running), I’ve been walking. I do this daily for at least an hour (although there is some stopping along the way because my dog is my companion). I’ve been adding some evening cardio (we have a stationary bike and a stair stepper) for about 20 min. at least a few nights a week because my metabolism is slowing more and I find it easier to exercise more than eat less. What I hate doing is toning and strengthening exercises. I’m doing some pushups and crunches now, but probably should do more. My question is, How can I fit those kinds of exercises in and keep them from being absolutely boring? I work full time, so exercise is mostly done in the morning and evening. My husband and I finally broke down and got a membership to our localYMCA.my issue is that I have a stressful job and a 45 minute commute each way to and from work. Is it better to work out early morning or at night? I know I need to do it because the stress is killing me and I’ve gained 20 pounds since I started this job a year ago! I’m taking the plunge! This is just the motivation I need seeing as we have a wedding at the end of this month and also in June and I am NOT comfortable with my current muscle tone and have become entirely too comfortable eating unhealthy, convenient and sugary foods since Christmas past! Thanks for the inspirational post and the resource too!! I have a different problem than some, I am skinny! I weighed more in high school while I played sports than I do now after having 2 kids who are 5 & 8. I am 5’6′ and just over 100 pounds. It’s not as glamorous as people make it sound. I wish I had a little feminine padding, ya know! I get light headed when I work out, dizzy if I stand up too fast, and yes, I do eat as much as everyone else around me. I homeschool my kids and cook and such, but I could probably find time if I would commit to it and could find something that I felt good about doing. You probably have low blood pressure like I do. I causes dizziness and the lightheaded feeling. My issue is more with motivation. I KNOW I should exercise. I WANT to lose weight. I work out generally 5 days a week (once with a trainer). It’s not getting easier. I don’t feel any better than I did when I started. It’s not fun for me. I do see some results but not enough to make me WANT to exercise more. My trainer works really hard to keep the workouts diverse, always with new stuff so I don’t get bored. I just don’t get that “exercise high” that I hear so many people talk about. No matter how hard or long I work out. It’s depressing tbh. This comes at a good time. I, like so many others I’ve read above, have exercised off and on but I just can’t get a routine going. I am not an early riser so doing anything before others are up is a no-go. I just can’t seem to find a time I can stick to. And I talk myself out of it so often. Oh, I’ll go later or I’ll do it tomorrow. Would a personal trainer help? Don’t really have the extra cash for that. So, I look forward to hearing what Jen has to say and checking out her site. I worked out with my husband (then boyfriend) 3x a week for an entire semester while we were in college. He was on the cross-country team and a former high school wrestler, so no stranger to working out and helped me with strength training on intensity, duration and form. We did strength training and aerobic (aerobic separately as there was NO WAY I could keep up with him). However, throughout the *entire* semester, after each and every workout, I would be absolutely starving, but have absolutely no energy. I would go back to my room and crash/nap. Many times I barely had the energy to take a shower before going to the dining hall for dinner. It never got any better. I didn’t increase the intensity of the workouts, and I even decreased the intensity at times. Ever since, I’ve been leery of exercise. Fibromyalgia and Chronic Fatigue Syndrome run in my family (my mom has both and often tells me that my complaints about pains/soreness/lack of energy remind her of her many years ago), and I have a bad knee (2 surgeries so far) that limits the exercises I can do. I can’t do anything high-impact longer than about a minute without causing my knee to hurt (for days). My mom and I split the cost of a trainer 4 years ago after the birth of my first son. That trainer wasn’t very motivating, nor did he seem to have any knowledge of what we could do with our individual limitations (Mom has 3 herniated/bulging discs). He kept trying to get us to do certain things that did nothing but aggrivate our issues. HUGE waste of money. I guess I’m just extremely UN-motivated to exercise. I can’t seem to justify the time and energy expenditure if the pain and tiredness never get any better. Any suggestions (by anyone) will be seriously considered. At this point I need to do something, but I just can’t figure out what.